Exercise is one of the most important, least utilized, tools in every founder’s toolkit. Think about it. You already know how important it is for your happiness and overall health. But, some of the biggest benefits are ones that can help you and your team to level up at work. Regular exercise is attributed with improving concentration, sharpening memory, speeding up learning, enhancing creativity, and lowering stress. Paul Graham, of Y Combinator, probably understands this more than most. He makes a point to all founders entering YC that exercise is as key to a startup’s success as building product and talking to users. Many of us who work at startups don’t even make an effort to get up from our chairs more than a handful of times throughout the day. Fortunately, it was reported that walking for just 2 minutes for every hour of sitting can reduce the risk of premature death by up to 33%. If that’s all it takes, let’s investigate a few habits and startups/tools your team can use to keep their hearts humming and brains firing during the workday. Fitbit — offers compact, wireless, wearable sensors that track a person’s daily activities in order to promote a healthy lifestyle (Growth Score: 2089). ClassPass — is an alternative to a gym membership that lets you go to the best boutique fitness studios in your city (Growth Score: 2266). Strava — is the online network connecting the global community of athletes (Growth Score: 657). Greatist — is the next-gen health media company for healthy-minded millennials (Growth Score: 410). At Mattermark, Fitbit has completely transformed our lifestyles at work (more on that in a minute). ClassPass is a great option for active people on the team who grew bored of their old routine and want to mix things up with other people in the office. Do you have any runners or bikers in your office? Strava is for those who want to record their running/biking routes and compete with c0-workers. Rounding out the group is Greatist. It won’t get people out of their seats, but it will inspire them to think of cleaner ways to eat and fun ways to get their blood pumping. Walk, don’t sit for all 1:1s and stand-ups. Drink lots of water (so you have no choice but to stand and walk to the bathroom often). Walk to lunch, don’t order it. Find a blow-off-steam buddy to walk with when you need a break. 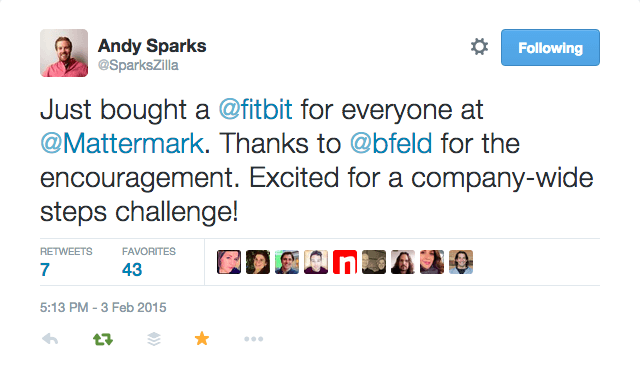 We mentioned before that Fitbit has transformed our lifestyle at Mattermark. The Mattermark team isn’t much different from all the other teams shipping product in SF. We’re encouraged to relax and enjoy ourselves on weekends, but we’re all hands on deck, sitting for hours at our computers during the week. That changed a few months ago when we introduced Fitbits into our office. Now, on every employee’s first day, she is greeted with a Fitbit sitting atop her desk. Not so surprisingly, introductions of fitness trackers to the office led to an uptick in competition. This July, we’re competing on steps. Every day you’ll see people offering to get coffee for the team, walking outside for 1:1 meetings, and taking mid-afternoon breaks to catch a second wind. How do you stay healthy and sharp during the week? We’d love to hear what you and your team do to keep moving on work days. Ping us on Twitter @Mattermark so we can chat!